CAMBRIDGE, MA — In Nature, cells and tissues assemble and organize themselves within a matrix of protein fibers that ultimately determines their structure and function, such as the elasticity of skin and the contractility of heart tissue. These natural design principles have now been successfully replicated in the lab by bioengineers at the Wyss Institute for Biologically Inspired Engineering and the School of Engineering and Applied Sciences (SEAS) at Harvard University. These bioengineers have developed a new technology that can be used to regenerate heart and other tissues and to make nanometer-thick fabrics that are both strong and extremely elastic. The key breakthrough came in the development of a matrix that can assemble itself through interaction with a thermosensitive surface. The protein composition of that matrix can be customized to generate specific properties, and the nanofabric can then be lifted off as a sheet by altering temperature. "To date it has been very difficult to replicate this extracellular matrix using manmade materials," said Adam W. Feinberg, a Postdoctoral Fellow at Harvard University who will be an Assistant Professor at Carnegie Mellon University in the fall. "But we thought if cells can build this matrix at the surface of their membranes, maybe we can build it ourselves on a surface too. We were thrilled to see that we could." Feinberg is the lead author of "Surface-Initiated Assembly of Protein Nanofabrics," which appears in the current issue of Nano Letters, a publication of the American Chemical Society. Coauthor Kit Parker is a core faculty member of the Wyss Institute, the Thomas D. Cabot Associate Professor of Applied Science and Associate Professor of Bioengineering at SEAS, and a member of the Harvard Stem Cell Institute. In the area of tissue regeneration, their technology, which is termed protein nanofabrics, represents a significant step forward. Current methods for regenerating tissue typically involve using synthetic polymers to create a scaffolding. But this approach can cause negative side effects as the polymers degrade. By contrast, nanofabrics are made from the same proteins as normal tissue, and thus the body can degrade them with no ill effects once they are no longer needed. Initial results have produced strands of heart muscle similar to the papillary muscle, which may lead to new strategies for repair and regeneration throughout the heart. "With nanofabrics, we can control thread count, orientation, and composition, and that capability allows us to create novel tissue engineering scaffolds that direct regeneration," said Parker. "It also enables us to exploit the nanoscale properties of these proteins in new ways beyond medical applications. There are a broad range of applications for this technology using natural, or designer, synthetic proteins." 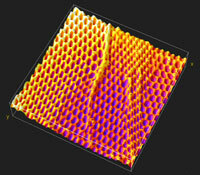 The research is part of a larger program in Nanotextiles at the Wyss Institute and SEAS. In the same issue of Nano Letters, Parker’s team also reported on the development of a new technology that fabricates nanofibers using a high-speed, rotating jet and nozzle. This invention has potential applications ranging from artificial organs and tissue regeneration to clothing and air filters. "The Wyss Institute is very proud to be associated with two such significant discoveries," said Donald E. Ingber, M.D., Ph.D., Founding Director of the Wyss Institute. "These are great examples of realizing our mission of using Nature’s design principles to develop technologies that will have a huge impact on the way we live." The Wyss Institute works as an alliance among Harvard’s schools of Medicine, Engineering, and Arts & Sciences in partnership with Beth Israel Deaconess Medical Center, Children’s Hospital, Dana Farber Cancer Institute, the University of Massachusetts Medical School, and Boston University. By emulating Nature’s principles for self-organizing and self-regulating, Wyss researchers are developing innovative new solutions for healthcare, energy, architecture, robotics, and manufacturing. These technologies are translated into commercial products and therapies through collaborations with clinical investigators and corporate alliances. 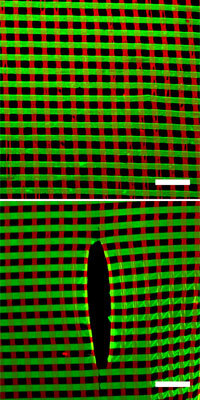 The researchers acknowledge the support of the Nanoscale Science and Engineering Center at Harvard, the Materials Research Science and Engineering Center at Harvard, Harvard Center for Nanoscale Systems, the Defense Advanced Research Projects Agency, and the Wyss Institute for Biologically Inspired Engineering at Harvard. The Wyss Institute for Biologically Inspired Engineering at Harvard University (http://wyss.harvard.edu) uses Nature’s design principles to develop bioinspired technologies that will revolutionize industry and create a more sustainable world. Working as an alliance among Harvard’s schools of Medicine, Engineering, and Arts & Sciences in partnership with Beth Israel Deaconess Medical Center, Children’s Hospital, Dana Farber Cancer Institute, University of Massachusetts Medical School, and Boston University, the Institute crosses disciplinary and institutional barriers to engage in high-risk, fundamental research that leads to transformative breakthroughs. By emulating Nature’s principles for self-organizing and self-regulating, Wyss researchers are developing innovative new solutions for healthcare, energy, architecture, robotics, and manufacturing. These technologies are translated into commercial products and therapies through collaborations with clinical investigators and corporate alliances.